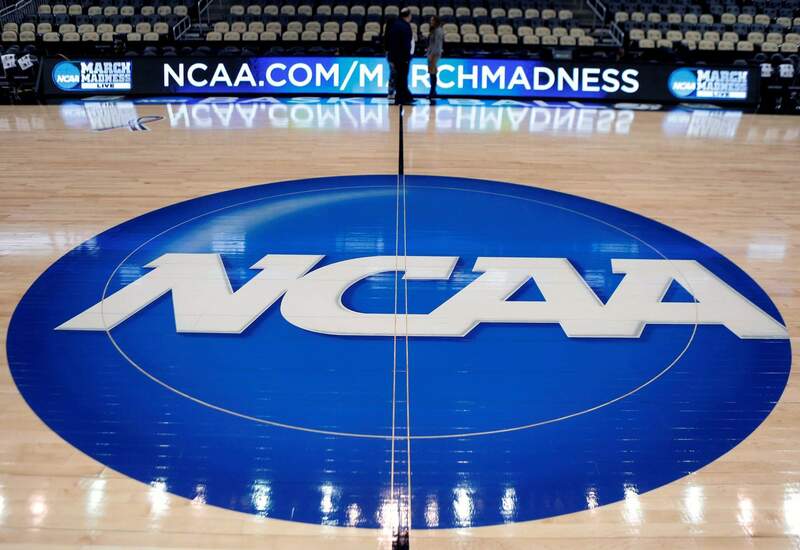 In this March 18, 2015, file photo, the NCAA logo is at center court as work continues at The Consol Energy Center in Pittsburgh, for the NCAA college basketball second and third round games. The NCAA will go to court Tuesday in California defending its amateurism rules against compensating athletes. The claim against the NCAA and the 11 conferences that have participated at the highest level of college football was originally brought by former West Virginia football player Shawne Alston and later merged with other similar lawsuits, including a notable case brought by former Clemson football player Martin Jenkins. The bench trial will be heard and decided by Judge Claudia Wilken of the Northern District of California in Oakland. Wilken is the same judge who ruled on the so-called O’Bannon case, which challenged the NCAA’s right to use athletes’ names, images and likenesses without compensation. The case produced a mix ruling that eventually went to the Ninth Circuit Court of Appeals. The Alston case is set to last about two weeks and Wilken’s ruling could come as soon as December or possibly January.